Thousands joined the "Save our Care" rally at the Capitol. 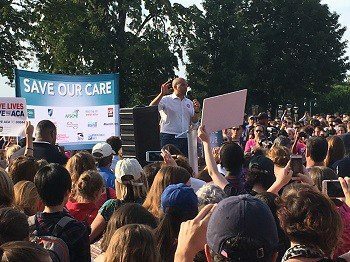 Thousands of activists gathered at the U.S. Capitol to remind Republicans that it is not OK to rip health care away from millions of Americans. 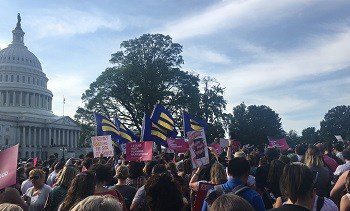 Carrying signs and encircling the heart of our democracy, activists on Wednesday night presented a unified front against the Republican effort to rip health care away from 22 million people. The mood at the U.S. Capitol was a mix of cautious optimism and steely determination. The rally started with a march around the Capitol, full of handmade signs and enthusiastic chants. Cars honked and cab drivers flashed thumbs-up in support as the long line of marchers wound around the east side the Capitol, with the Supreme Court in the background. Kathleen battled cancer in the pre-ACA era. While she had a very good health insurance policy, the fine print of the plan meant that she hit her coverage cap in the middle of her chemotherapy. Insurance stopped paying for her treatment, something that can no longer happen, thanks to Obamacare. Luckily for Kathleen, the community hospital where she was receiving care agreed to waive her fees for the remainder of her treatment. “Others aren’t as lucky,” she said when asked why she was marching, noting that the GOP bill was not about improving health care, but rather, just a tax cut for the rich. As speakers took the stage, the energy was palpable. Oregon Sen. Ron Wyden reminded the crowd that Senate Majority Leader Mitch McConnell was forced to postpone a vote on a bill because of those in the crowd and others around the country had flooded their offices with visits and calls and emails and tweets. The theme of cautious optimism was constantly reinforced with calls to action by speaker after speaker. All acknowledged that the voices of mothers and fathers and doctors and nurses and union workers across the country led to the pressure so the vote was postponed, but each also acknowledged that the upcoming congressional recess was critical for activists to continue to pressure their senators. As many speakers noted, Republican men are already drafting a new version, once again in secret with no input from Democrats, patient-centered groups, or the voice of the people. The most sustained applause of the night was a close competition between the introduction of House Minority Leader Nancy Pelosi and then later California Sen. Kamala Harris. To capitalize on "our moment," Jillian McLeod-Tardiff flew in for the rally from Portland, Maine. Sporting a pink Planned Parenthood t-shirt, McLeod-Tardiff said she is in D.C. to thank her senator, Susan Collins, for standing up for Planned Parenthood. Collins is one of the few Republicans who came out against the bill before McConnell decided to postpone the vote. Congress soon leaves for its annual Fourth of July recess, and lawmakers will all be back in their home states. Activists across the country plan to remind them why this bill is a "death sentence" for millions. To make the most of this time, the progressive grassroots organization Indivisible has created the TrumpcareTen, an easy-to-use site with all the phone numbers and talking points people need to make sure their voices are heard. They, and many other organizations and Democratic lawmakers, have a clear message to people worried about the Republican plan to destroy health care. Call. Write. Visit. Email. Post. Tweet. Snap. March. Then make sure all your friends have done the same. Don’t miss your chance to stand up to a seismic transfer of wealth from the poor and middle-class to the uber-wealthy. Don’t miss your chance to fight for the millions of neighbors who could lose access to life-saving medical care. Don’t be left out. Get involved and make your voice heard. This rally was a beginning, not an end. 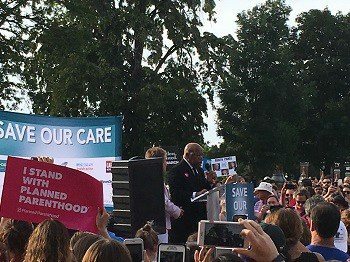 As Rep. John Lewis (below) said to the cheering crowd, "Go out there and make some good trouble."